The Shinkan Hiden Shō (新刊秘伝抄) from the end of the Muromachi period advises for cursed swords to carve as many Sanskrit characters for bhrūṃ (Jap. boron, see picture below) around the signature as the age of the owner. This character stands for driving out evil and serves also as a purifying symbol. 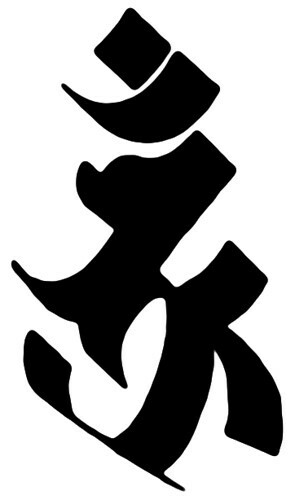 Sanskrit character (Jap. bonji, 梵字) for bhrūṃ. The origins of systematic kensō rituals during the Edo period lie in Kyūshū´s Bungo province of the Muromachi era. In the Bekki Ryū Kensō Hiroku (戸次流剣相秘録), a certain Ōtomo Tsurumaru (大友 鶴丸) is mentioned as the founder of the Bekki school (戸次流) of kensō. It is said that that he was the adopted son of Bekki Tajima no Kami (戸次但馬守). When we take a look at the genealogy of the Ōtomo family we can assume that the nickname Tsurumaru probably refers to Chikatake (大友親武), because his youth name was Tsuruhōshi (鶴法師). Chikatake was the son of Chikashige (大友親繁, 1411-1493), who was in turn the shugo military governor of Bungo and Chikugo. So Bungo was quasi the stronghold of kensō from where it was distributed all over the country. Also well known was the Usa school (宇佐流) from the village of Usa of the same name. According to extant documents of the Usa school, it was founded by a certain Ōkōchi Yorinaka (大河内頼仲) in the third year of Tenshō (天正, 1575). Kensō eventually became fully established in the mid Edo period, mostly through the propaganda of the Usa and Bekki schools. Publications on this subject increased from the early 19th century onwards like, for example, the Kensō Shinpi Roku (剣相神秘録) from the second year of Kyōwa (享和, 1802) or the Sōken Seiden (相剣正伝) from Bunka five (文化, 1808). Besides the Usa and Bekki mainstream of kensō other schools also emerged who competed with each other. These were, among others, the Yamagata (山形), Ogasawara (小笠原), Yamamoto (山本), Wada (和田), Okabe (岡部), Takuma (宅間), Kinoshita (木下) and Fudō (不動) schools. But how was kensō performed? In general, the principles of yin and yang (in´yō, 陰陽), the Five Elements (gogyō-setsu, 五行説), and astrology were mainly applied. Yin and yang is used to describe how polar opposites are interconnected and are interdependent in the natural world, and how they give rise to each other in turn in relation to each other. So it was used to explain processes of transformation and “ups and downs.” That means after yang is at its height, inevitably a decline of yang and a rise of yin follows. The system of Five Elements, based on the so-called Five Phases, is used for describing interactions and relationships between phenomena. The Five Elements wood, fire, metal, water and earth are now used to describe the state of the Five Phases in nature. If sun or crescent shaped tobiyaki (飛焼き) – small isolated temper elements atop of the actual temper line (hamon, 刃文) – were spotted, the kensō would say that this was a very auspicious omen. But slanting saka-ashi (逆足) counteract their power, that means they lower the auspicious effect of the tobiyaki. Regular ashi on the other hand, that means ashi which form a midare-hamon (乱れ刃文) with a regular rhythm, stood for luck and a secure, harmonious married life. If we refer to the above mentioned kensō schools we notice that Muramasa blades show many unlucky features. A peculiarity of his temper line was, for example, that it drops deeply down to the cutting edge between the waves of the midare (see picture below). The Yamagata school says that this is unlucky and causes unsteadiness and therefore a sword with such characteristics should never be worn or presented at a celebration or a wedding. The Ogasawara school says that a koshiba (腰刃), a singular high rising temper element in the habaki area is also not good because it stands for an excessively proud sword wearer. Thus it was very impolite to wear such a sword in the presence of ones lord. But the schools interpretation varied for a hamon. For example, the Okabe school says that a deeply dropping hamon stands for a „stabilization of luck“ because these areas remind us of a ship running aground in shallow waters. In a figurative sense, the luck was “running aground” too and came to a halt for the sword wearer.